Let me start this article by saying that I love Spotify. Great company, great team – and lately, rather ironically given the naysaying of Thom Yorke et al, emerging as something of a potential music industry saviour when you look at the machinations of Google, Amazon and other tech giants, who seem fairly intent on driving the value of music down to zero. So, to summarise: I’m a big fan. Having said that, I feel there’s an awkward question that has to be asked, namely: why, in Spotify’s Browse section, are 99.9% of the playlists Spotify’s own? 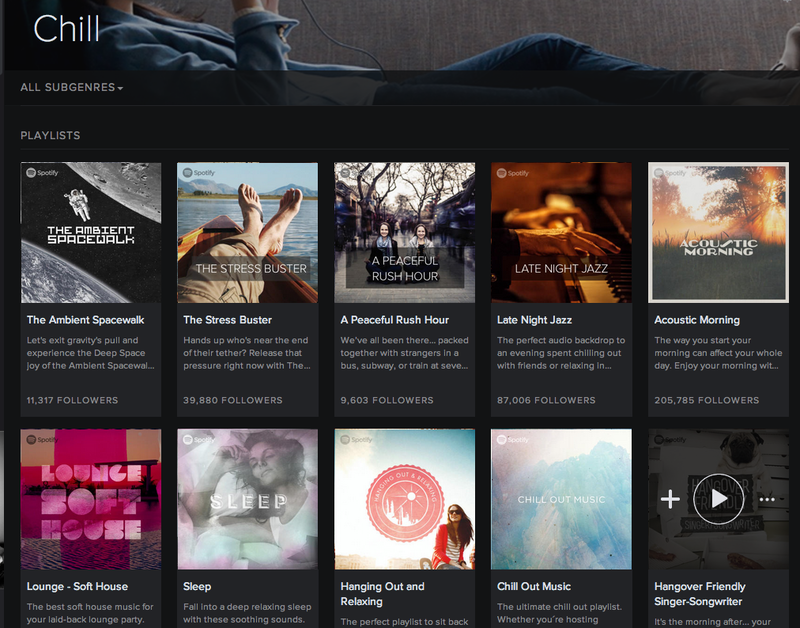 If you’re not familiar, Browse is the “uninformed” discovery section – the editorial area where Spotify can push playlists of its choosing. At the top are more day-to-day relevant playlists, and further down are various mood-related starting points which then offer a variety of playlists to choose from. 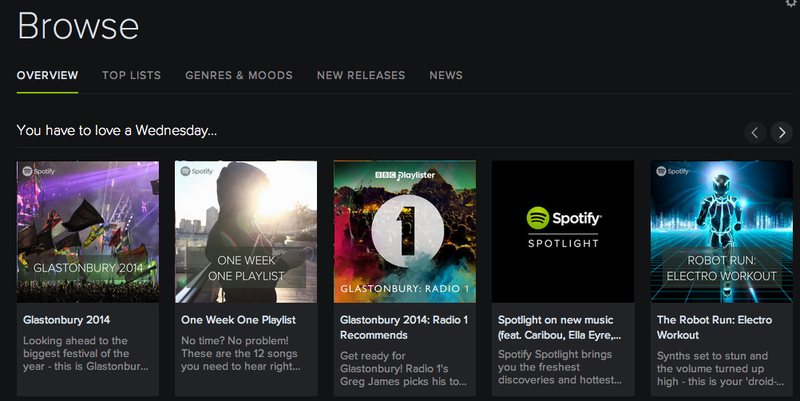 Of all the playlists shown there, only the BBC’s Playlister one in the centre isn’t made by Spotify. Every single playlist on that screengrab above is made by Spotify. Check out any of the mood playlists and the results are the same: the only playlists being pushed (with *very* rare exception) are Spotify’s own. Indeed, checking out the Top Lists section, I had to get to the 46th playlist on the page before I was looking at one not created by Spotify. To me, this is a problem, for a couple of reasons. Spotify are certainly encouraging artists to build connected audiences on their platform, and the #1 means to do this is by curating playlists that give fans more reasons to connect with you beyond just the artist catalogue. Many artists are doing this too; there’s a definite logic at work, not least because when you build followers on the artist profile in particular, those people are all notified when a new release goes up. Ergo, this is a sensible way to build a strong response from the moment a new track, single, EP or album goes live. The problem though, is that if Spotify themselves aren’t liable to support your playlist, you are left to use the artist’s own social media platforms to drive awareness. And, with Facebook in particular having an organic reach problem of sorts, that might well also mean spending money to drive people to Spotify via promoted posts. Now, in and of itself, that’s not a bad thing. Building an audience does require time and, yes, money. However my issue here is that Spotify has a large editorial section in which they could support artist playlists… and instead they’re only promoting their own. Of course, a counterpoint here is that Spotify *are* supporting artists, because they’re adding them to their own playlists. That argument is correct, and having your artist’s song added to one of their larger playlists may well have a transformative effect. This however brings me to my second point: that of Spotify favouring their own playlists whilst encouraging people to create their own. In many respects, it reminds me of Twitter’s now infamous about-face with 3rd party clients. At the outset, when it worked for Twitter to have developers building countless clients for their platform and driving adoption, access was unlimited. Over time though, Twitter realised they would do better to control all access and drive it through their own clients so that they could push adverts and increase revenues. Support for 3rd party clients was cut to a near-unusable state, and as such that entire ecosystem is bordering on extinction. Put simply: one could say that it feels rather like artists (and others) are being encouraged to create playlists and drive users to Spotify, only to then find that on the platform those playlists see little or no support whatsoever. Spotify is an audio platform. Its primary function is to provide an unlimited supply of music; that is what people sign up for. Discovery is another area entirely. On the “informed discovery” front, the company now has Echo Nest on board to drive recommendations for you based on what you’ve listened to. However in the Browse section, where what you have is human-curated editorial, Spotify have decided that they should be virtually the sole curator (with minimal exception) of this unlimited music supply. To me, that’s a bad move. They have a chance to represent an insane amount of content created by some of the finest curators out there. Instead, they’re doing it all themselves and shutting out the opportunities for others. I was talking to an artist manager recently about playlists, suggesting that his artist create some to drive connections on the platform. “Why?”, came the response, “They never support them anyway! Their entire editorial is their own playlists, not artist ones”. He has a point – and to my mind, that needs to change.